Here is a procedure for hiring a tradesperson, contractor or professional. John Leeke (Historic Building Specialist, Historic HomeWorks) has developed this procedure during four decades of work as a tradesperson, contractor, professional adviser, and owner of older and historic buildings. 1. Know what you want. 2. Recognize good work when you see it. 3. Make a choice between at least two qualified prospects and their fully developed proposals. 5. Follow preservation standards to get approval from local design review board and secure state tax credits. Your project may have to follow the formal Secretary of the Interior Standards for historic preservation. If so, be certain your tradespeople, contactor and professionals know about and have experience working under these standards. If work is done that does not meet the standards you may not qualify for certain financial benefits you are expecting, such as grants and tax credits. Virginia has a generous state tax credit for historic preservation that includes homes/homeowners. It is called Virginia's Historic Rehabilitation Tax Credit Program. You may have to call up to 25 or 35 prospects, to get 10 or 12 to visit your site, to get 2 or 3 who are responsive enough to give a written proposal for the work you want done. Ask the prospects for references to include contact persons, project descriptions and locations. For projects over $1,000. get at least three references. For projects over $20,000. get at least five references. For projects over $50,000 get ten references. Talk with at least three references from each. Then study your notes and see what is common to all three. That will probably be the "common practice" or "minimum standard practice" for that trade or profession in your area. You will also learn a little of the specialized "lingo" for that work. Go to the library and study the books or do research on the internet. Then decide what you want to have done and write it up. Express it mostly in your own words, use some words and phrases from the handouts and proposals, but do not simply copy long sections verbatim. You probably will want something that goes beyond "minimum standard practice." Include at least one important aspect of the work that is recommended by each prospect. Some tradespeople and contractors will not be expecting to go through these extra steps of refining their proposals to get a contract with you. They are used to the owner simply accepting what they offer the first time. Each will have their own policy on "free estimates," whether or not to charge for the first estimate or proposal, and if there are fees for second or third revisions. Essentially, they are helping you plan your project and that is worth something. If they are reluctant to go through these extra steps, you might offer to pay them for their time, or decide they are not responsive enough for your needs. Some tradespeople and contractors are used to bidding on projects where everything wanted is already decided and specified in detail, in this case you may need a professional to help you plan your project and write specifications. You can use this same procedure to hire the profession, who might be an architect with historic preservation experience, or a preservation consultant, or a project manager. F. Now select the prospect that rates highest and check with third parties such as the building codes enforcement officers, county court clerks, to determine their reputation. Local and state historic preservation office staff may be helpful, including tax credit staffers. You will have to pay for the work sample, usually at a higher rate per unit than if the whole project is done at once. This is part of the price of finding the right tradespeople or contractor the first time around. Some official preservation standards require work samples before the main body of work is done. Work Sampling can be expanded to Testing & Development. If you are asking them to do something they have never done before (but you both think they are capable) then the tradespeople can try out different methods to determine what works and what doesn't; and develop the materials and methods that will work. Of course, you pay for this testing and development, sometimes on an hourly basis with a top limit, etc. This also gives the tradespeople a chance to develop costing figures for the main work by keeping track of their time and materials. This is a great "trust builder" since you both learn together what is required and what the costs are. Neither of you are exposed to costs getting out of control, since the terms are time and materials, and the sample is limited in size or scope. When the work sample is complete, thank them for the work, pay them, wait at least a day, up to a week or more, and decide whether or not the work is acceptable. H. Ask for a written contract for the main work when the sample work is acceptable and you decide to have this prospect do the rest of the project. Include in the written contract that the work is to be done exactly like the approved sample work, with the same methods, materials and results, and to be done by the same workers. If the work of the sample is not acceptable, if they just can't solve the problems and get it right, be sure to pay them and thank them in writing. Then have one of the next-rated prospects do a work sample. Repeat G. and H. as needed. Does this sound like a lot of work? Yes, it is a lot of work to get the right people on your project in the beginning. If you happen to get the wrong people on your project you will put in at least this much work recovering from the problems they leave behind, and probably a lot more. Do you really have to follow every step? No, in some situations some steps may not be necessary, possible or appropriate. Success may diminish if some steps are not followed. But, if this procedure is followed the likelihood of success increases dramatically. With a little careful planning, you can enhance the energy efficiency of your house and be sensitive to its historic character. That's not only good for you and your house, it's good for the planet. 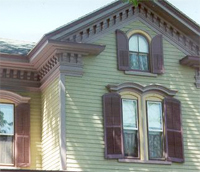 Read more about How To Preserve Your Historic Home from a list of books recommended by the National Trust for Historic Preservation on their Books Page. In 2005, the National Trust Preservation Fund provided almost $17 million in financial assistance and direct investment to support preservation in cities, towns, and rural areas all over the United States.